Subungual melanoma is a type of longitudinal melanonychia, but what are the tipoffs that longitudinal melanonychia is malignant vs. benign? 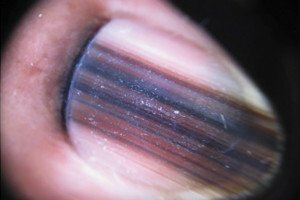 A brown or black band, stripe, streak or line in a nail is a very common occurrence in men and women of all ages and races. It has many causes including pathological. When you were a child, you probably noticed, from time to time, a brown streak or line in a fingernail and thought nothing of it. Until you were old enough to begin using the Internet and searching what causes these brown lines to form in the nail. After all, you were just plain curious. However…something unexpected happened: Links to melanoma sites popped up in the search results. 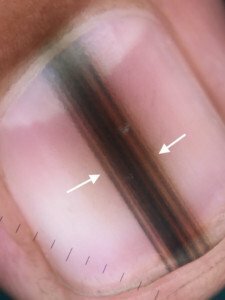 “Longitudinal melanonychia is a vertically oriented pigmented streak in the nail,” says Zain Husain, MD, FAAD, board certified dermatologist and fellowship-trained Mohs micrographic surgeon with New Jersey Dermatology & Aesthetics Center. • Melano means pigment, but not necessarily the pigment-producing cells called melanocytes. • Nychia refers to the nail. Thus, longitudinal melanonychia is an umbrella term that describes a particular appearance to a fingernail or toenail. This is far more concerning, in the absence of trauma, than if it were present since birth (congenital birthmark under a nail). “However, longitudinal melanonychia can arise from subungual melanoma, which is melanoma arising from the skin,” says Dr. Husain. These are key features to be on the lookout for when you first discover a tan or brown line in a nail. If it’s a subungual hemorrhage (old blood under a nail), it will NOT widen over time. In fact, a hemorrhage under a nail will be slowly pushed out as the nail grows. It will also thin out and become shorter. 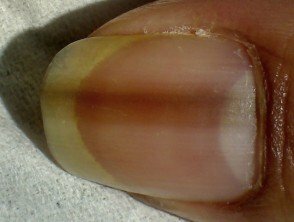 If you check it every several days or so, you’ll see that the space between its bottom and the cuticle area (proximal nail fold) is increasing. The streak is moving up as the nail grows out. This will not change if you trim the nail, because the nail is continuously being pushed out from the nail fold. This increasing “nail space” between the cuticle and the bottom of the brown streak is extremely reassuring. After all, a subungual melanoma will remain fixed in place, no matter how much or fast a nail grows. A subungual melanoma WILL get wider, thicker, and often darker, because it’s a mass of proliferating cancer cells. You may see various lines, parallel to the length of the nail, making up the dark band. The lines may be of various shades of tan, grey and brown, and may include black. Malignant longitudinal melanonychia usually consists of multiple shades rather than all one color. Its bands will appear parallel to each other, but won’t be perfectly parallel to each other – a few may be off a bit. The right image at the very top of this article shows subungual melanoma. A benign melanonychia may also have parallel bands. They will be more uniform in color and more perfectly parallel, as in the very top image on the left: benign longitudinal melanonychia. Thus, the presence of parallel lines does not automatically mean cancer. Unlike blood under a nail, a subungual melanoma (can’t say this enough) simply will NOT go away. A benign mole or birthmark under a nail won’t go away, either. However … it won’t widen and darken over time, either! “Sometimes the proximal nail fold can have pigment, referred to as Hutchinson’s sign,” says Dr. Husain. Nail melanoma. Note the Hutchinson’s sign at the cuticle or nail fold. There’s a second Hutchinson’s sign at the top of the nail, in the skin. Nail melanoma. Another example of Hutchinson’s sign. 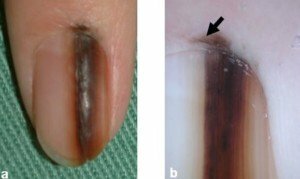 However, a harmless elongated mole or congenital birthmark may also have what appears to be a Hutchinson’s sign: the presence of brown pigment in the tissue and skin around the nail (below, above and/or on a side). When harmless melanin production causes this, it’s called pseudo-Hutchinson’s sign, because it’s not a true Hutchinson’s sign. A true Hutchinson’s is caused by subungual melanoma. Unfortunately, it can be very difficult for a dermatologist to tell one from the other with a naked-eye examination. 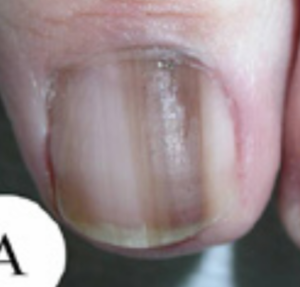 A subungual hemorrhage may result in bruising around the nail, mimicking a Hutchinson’s sign. But this bruising should go away relatively quickly. “Sometimes subungual melanomas have thin, fairly uniform melanonychia, which can be difficult to differentiate from benign melanonychia,” says Dr. Husain. 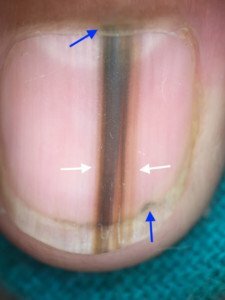 And sometimes, a benign band or streak can be very dark and be shaped like a malignancy – wider at the bottom of the nail and getting narrower as it goes towards the top of the nail. It may also appear black, yet still be benign. As you can see, there is significant overlap in the way they look to even a trained medical eye. 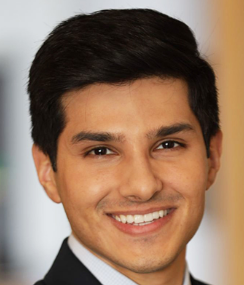 “Dermascopy can help magnify the pigment network and allow dermatologists to get a better view to determine the nature of the melanonychia,” says Dr. Husain. Even under the magnification of a dermatoscope, the distinction can be difficult – and in these cases, a biopsy is called for. You can wait around over many months to see if the band is progressing or if a Hutchinson’s sign develops, or if one that’s already present continues to spread. Or, you can get the biopsy. Melanoma on the left, benign mole on the right. “There can be symptoms such as itching and bleeding at the site,” adds Dr. Husain, referring to subungual melanoma. The cancer will also cause destruction, distortion or splintering of the nail as it progresses. But don’t wait for it to reach this point. What points AWAY from melanoma is if a similar dark streaking is present in more than one nail. However, there’s always that possibility that the longitudinal melanonychia in one nail is subungual melanoma, and in the other nails is benign. 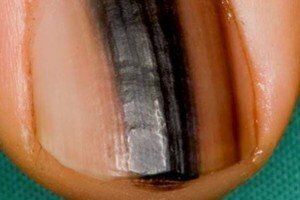 Is Nail Melanoma Always a Stripe or Can It Be a Smudge? 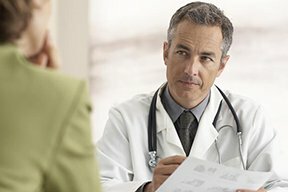 What Are All the Different Colors that Nail Melanoma Can Be ? Can White or Olive Skinned Children Get Nail Melanoma?